Referred to as the "Mont Blanc Style" these distinguished twist ball pen writing instruments are impressive looking. Contain a smooth writing Cross Style refill, a body made out of Yellow Box Elder, a design featuring Nickel Satin fittings and a stylish designer band. Made in the USA by Lanier Pens. Nickel Satin Cross Style Ball Point Refill available in Black and Blue. 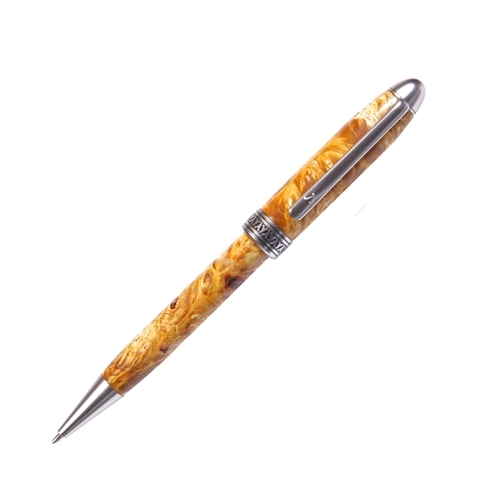 Note: All Lanier Pens are made from natural exotic woods and may very slightly from the shown image. optional ink colors for Medium Tip refills.